Media caption Mayor Cruz gave a news conference on Friday: "Mayday, we are in trouble"
Donald Trump has lashed out at Puerto Rico politicians over their criticism of US relief efforts on the island following Hurricane Maria. The category four hurricane a week ago killed 16 people on the island and left millions in need of aid. In a series of tweets, Trump said that Puerto Rican officials showed "poor leadership ability" and "want everything to be done for them". It comes after the Mayor of San Juan made a desperate plea for federal help. "We have no time for patience any more," Carmen Yulin Cruz said in a news conference. "I am asking the president of the United States to make sure somebody is in charge that is up to the task of saving lives. "I am done being polite. I am done being politically correct. I am mad as hell." She then appeared in a T-shirt that said "Help us, we're dying" for a CNN television interview. Does Trump care about Puerto Rico's hurricane victims? The mayor, who is living in a shelter after her home was destroyed, said Puerto Rico is set to be without power for six to eight months after the storm damaged 90% of homes on the island. More bad weather is in the offing, with the National Weather Service in San Juan warning that a strong thunderstorm would imminently affect the east of the island, with torrential rain and strong winds expected. Almost half the island's 3.4 million population are without drinking water, the US Defence Department said on Thursday. Efforts are being made on the island to clear road access and restore hospitals to working conditions. In a series of tweets on Saturday morning, Trump suggested the mayor had been told "to be nasty to Trump" by his Democratic opposition. He also said he would visit Puerto Rico on Tuesday with the First Lady, Melania. 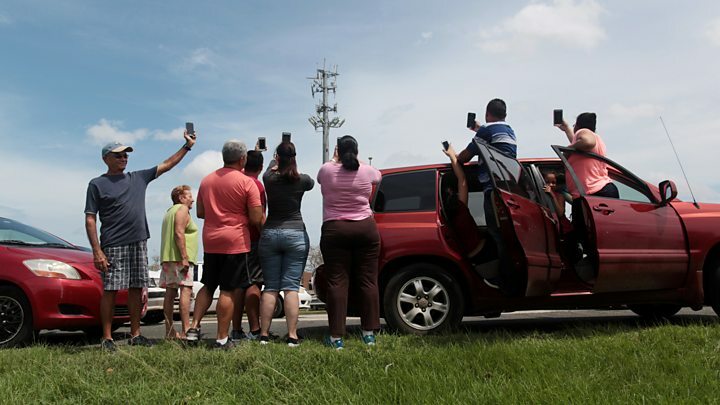 It follows widespread criticism of his administration's response to the hurricane. Responding to Trump's tweets in an interview the mayor said: "I was asking for help. I wasn't saying anything nasty about the president." "I will continue to do what I have to do, say what I have to say, compliment the people that I have to compliment, and call out the people that I need to call out. "This isn't about me. This isn't about anyone. This is about lives that are being lost." We visited a school in Loíza, just to the east of the capital, that had become a makeshift hurricane shelter. Nobody there had heard of the row between Donald Trump and the mayor of San Juan. They had, after all, no phone signals, no internet, no television and had much more pressing things to think about. Most had lost their homes and any belongings they had not managed to grab before Hurricane Maria struck. They told us they finally received mattresses to sleep on a full nine days after the hurricane, after having slept on the bare concrete of the classrooms until then. They said they had been visited by an official from the Federal Emergency Management Agency only on this, the 10th day. These people are in accessible areas close to the capital. There are fears about many in remote areas still waiting to be reached. On Thursday the President announced shipping restrictions had been lifted to help provide aid to the island. The US military general in charge of the relief operation said on Friday that about 4,500 troops were already involved. 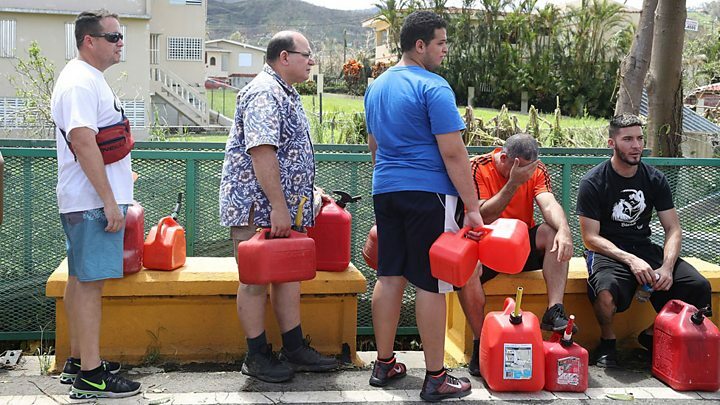 The US Federal Emergency Management Agency (Fema) said 95% of the island remained without power and 55% of people did not yet have access to drinking water, but that most petrol stations had reopened. 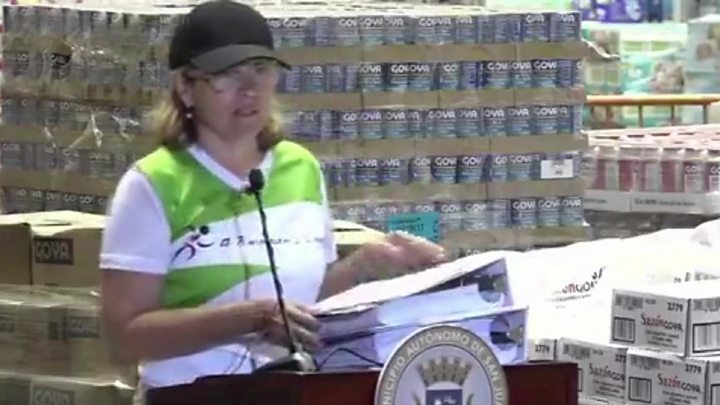 Concerns were raised on Thursday that thousands of shipping containers of aid were sitting in a San Juan undistributed. Ground transportation has been hindered by a lack of fuel and blocked roads. The US navy has deployed a hospital ship and has assigned engineers to repair the island's damaged power grid, the US Department of Defense said on Friday. Puerto Rico is a US territory but does not have direct voting representation.